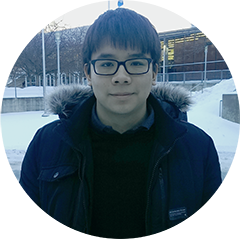 It’s hard to argue with Thanh Thong Nguyen’s rationale for choosing to study physics: “space stuff is really cool.” Thanh, BSc’19, has been following the SpaceX rockets launched by Elon Musk and began his program in physics at McGill keen to learn more about astrophysics and astrobiology. “I chose physics after CEGEP because it was the only thing I could see myself doing,” he said. Thanh started to take steps towards his future as a physicist in September when he began his McGill degree, but his first semester was tough. Not only was he adjusting to a university-level workload, but his mother was diagnosed with breast cancer last year and Thanh split his time between caring for her and studying. Thankfully, the Hydro-Quebec renewable Entrance Scholarship he received has allowed Thanh and his mother to focus on her health instead of his tuition bills. It’s made a world of difference for the close-knit family of two. Originally from Ontario, Thanh and his mother arrived in Quebec when he was ten. “The first year was a little lonely,” said Thanh, who didn’t speak French and grew up in a primarily Francophone neighbourhood. But within a year he had adapted and learned the language enough to be comfortable in his new home. Thanh is adapting to McGill as well, aided by the confidence boost the Scholarship gave him. It’s also given him the opportunity to connect him with students who received similar aid, as well as Hydro-Quebec executives, whom he met at a gala celebrating the company’s scholarship recipients. Thanh hopes that his first summer as a McGill student will be spent working in a lab— a distinct possibility thanks to the Faculty’s donor-supported Science Undergraduate Research Awards. He’s particularly excited to explore the research opportunities available at McGill because he hopes to go to graduate school and pursue an academic career where ideally he could combine his two passions: physics and environmental sciences. Thanh’s dream future? To run his own lab and discover something new and revolutionary in physics – or at least, something really cool. “There’s a lot we don’t know,” he said. One thing he does know: “I’m really proud to be a winner of this Scholarship.” And that’s pretty cool too.